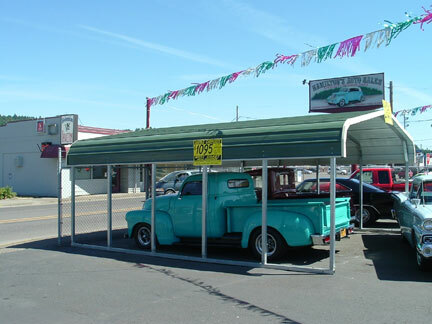 Hamilton's Auto Sales also sells Carports and Enclosed Carports to help you store your vehicle. These are well built West Coast Metal Buildings, with Free installation anywhere in Oregon. Call- (541) 942-8888 for more information. 1990 Dodge Power Ram 2500, Cummins Turbo Diesel 4x4. 5.9 liter 12 valve, 5spd. manual transmission. 1- owner truck with 206,978 miles. This is one of the nicest old Diesel trucks you will find ! Always maintained perfect. Never any rust or body damage, original paint went bad so 10 years ago had a nice quality repaint back the original color. Interior looks close to new. Has aftermarket CD stereo, Like new tires, sliding rear window, spray in bed liner. Very hard to find old truck in this condition. # B-1792 $12,500 SOLD! Manx style Dune Buggy, Titled as 1956 VW, clean title. 1600cc motor, 4spd. New clutch, carb, and tune-up. Runs out great. Clean little Buggy inside and out. Like new tires, Stereo. Tow ready including tow bar and 4 plug wiring. # A-2099 $4,950 SOLD! 2012 Chevy Sonic LT Hatchback. 1.8 Liter 4cyl. 6spd. auto transmission. 1-owner with 26,482 original miles. Super clean car always garaged. Loaded with options - see pictures there is one of original window sticker for all options. Car is pretty much new condition. # A-2098 $9,450 NOW! $7,450 SOLD! 1979 Ford F-250 Custom, Explorer 4x4. 300 6cyl. 4spd. 2 owner Local truck. Super straight and solid original body and paint. Behind the passengers rear tire just in front of the bumper there is a little rust and there is a close up of it in the pictures. Other then that just some surface rust. Interior is good, it has been changed to bucket seats w/center console. CD player and a couple after market gauges. Dual tanks. Tires are near new - LT 235/75 16, less then 5,000 miles. These trucks are hard to find in this solid of condition. Ready to drive and looks good as is, or excellent truck to restore and bring big money. Runs excellent! # B-1789 $6,750 SOLD! 2003 Ford F-250 Super Duty, 4x4 Crew Cab. 6.0 Liter Diesel, 6spd manual. Good straight and clean truck. Lifted with good tread on 35x12.50 18' Toyo A/T tires. PW, PDL, P-seat, CC, A/C, After market CD player & Gauge pack, Spray in bed liner. $1,700 in recent work there is a picture of receipt in listing. Good running and driving truck. # B-1786 $11,750 NOW! $9,950 SOLD! 1985 Chevy Camaro Z28. 400 SB chevy V-8. Auto trans w/shift kit. Real clean Hotrod. Body is straight with nice newer paint, Aftermarket hood. Interior is original and real nice condition, Head liner is sagging. Is and original A/C car but pump removed from motor. Motor has aftermarket intake and carb, Headers, ignition, Cam. Motor runs real strong I'm sure its all been gone through but owner has passed away and don't have any specific information on it. Tire are like new. Drive's out excellent! # A-2088 $3,950 SOLD! 2003 Buick Le Sabre. 3.8 Liter V-6, Automatic trans. Excellent condition inside and out. AC, CC, PW, PDL. Car has good tire, 186,916 miles with no problems. Runs and drive excellent. # A-2078 $1,950 $1,750 SOLD! 1995 Toyota T-100 xcab 4x4. 3.4 liter V-6, 5spd. manual transmission. 150,379 original miles. Excellent maintenance. Have receipts of work done with in the last 9,000 miles - New Timing belt, water pump, Clutch kit, Front brakes and calipers, service A/C and clean blower fan. New Michelin tires. A/C, CC, Tilt wheel, After market CD player, Sliding rear window, Bed liner, Tow package. Interior is excellent and clean with just the normal wear hole on drivers seat cover. Body and original paint very good with some scratches and couple small dents. This truck runs and drives like new! $9,450 SOLD! 1989 Ford Bronco II Eddie Bauer, 2WD. Original and super clean with 85,797 orig. miles. Inside and out this is the cleanest original Bronco II I have seen. 2.9 V-6, Automatic transmission. A/C, CC, PW, PDL, after market CD player, New tires. This rig runs and drive as good as it looks. Hard to find with these low miles and excellent condition ! $3,750 SOLD! 1997 Chevy Camaro convertible. V-6, Automatic transmission. A/C, CC, PW, PDL, newer tires, P-top in good condition. Clean body, paint and interior. 124,367 miles. 1984 Chevy Corvette. The car has 51,707 original miles. Adult owned, the car had to have a new Long Block at 43,695, Marvin Smith Auto Repair did all the work and we have all the receipts. The paint appears to be original and very nice with no body damage. The original interior looks as good as new. All power and A/C work correctly. Tires are excellent. It would probably be hard to find a better 84 Vette. # A-2061 Motivated seller won't last at this price! SOLD! 2013 Dodge Ram 2500 Heavy Duty Laramie Crew cab 4x4. 5.7 L Hemi V-8, 6-spd. auto transmission. This truck has 93,380 easy HWY miles and don't have any flaws to speak of. Almost new Michelin tires. All maintenance done at Lithia in Springfield OR. I have the original window sticker posted with the addition pictures for all option on truck. Just click on picture of truck to view them. # B-1784 $28,950 NOW! $26,900 SOLD! 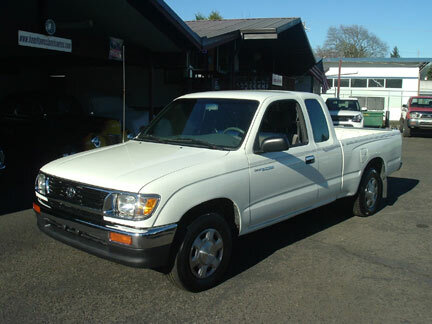 1999 Toyota Tacoma Xcab 4x4 SR5. 3.4 Liter V-6, Automatic trans. This is one of the cleanest older Toyota's you will find. Adult owned, truck has 238,688 miles but has been maintained and treated like a car. A/C, CC, Tilt, Sun Roof, PW, PDL, Sliding rear window, Factory AM/FM Cass, Bed Mat, Tow package, Nerf bars. With in the last 5,000 miles as got New tires and wheels, Brake job - new calipers, rotors ect. Truck has no body damage and excellent paint. Interior is in excellent condition, clean seats under seat covers. It would be real hard to find a nicer old Tacoma ! # B-1781 $9,950 NOW! $8,950 SOLD! 1993 Ford Ranger Splash 4x4, Only 86,368 Original miles. 3.0 V-6, automatic trans. PS. PDB, A/C, CC, PDL, PW, After market CD player. Super clean cloth interior. Original paint nice with no body damage. Hard bed cover and bed liner. Like new 235/75/15 Wild Country All terrain tires. Super nice truck! # B-1755 $6,950 NOW $5,950 Make Offer! 1994 Jeep Wrangler Hard top. 4cyl. 5spd. I have receipts on recent motor work for $1,500. Brand new 35x12.50 Cooper Discover SST tires. Good clean body. interior good no carpet or rubber mat. Has after market CD player and speaker bar. Good running Jeep. # B-1777 $8,950 NOW! $7,950 Make Offer! SOLD! 1978 Harley Davidson FLH. 74 cu. in. Shovel Head, Motor updates - New .010 over sized pistons, Andrews 'B' grind Cam, New style Teflon valve seals, Jims big pushrod rollers, SS solid pushrods, SS carb, Dyna electric ignition w/ dual coils, Speedometer was replaced when work was done and show 11,000 miles. 4spd. transmission, Disc brakes front and rear, Swing arm frame, 5.00-16 tires front and rear, 5 gallon tank, 20-50 wt engine oil, Syn. trans oil. Very good condition. # C-236 SOLD! 1979 Toyota Pickup 4x4. 20R 4cyl. w/ Weber carb. 4spd. transmission. Good straight truck for the year. Clean interior, Newer tires. 4x4 works good and runs and drive great. # B-1773 $3,750 SOLD! 2012 Toyota Tacoma 4x4 Double cab SR5 short bed. 4.0 Liter V-6, auto trans. Truck has 56,343 miles and is in excellent condition. This truck is at our classic car dealership but it is my sons truck and will be sold as private sell. He is willing to take something on trade of value up to around $5,000 so let us know what you have and we can tell you if interested. Truck has leveling kit with Toyo MT 265/75R 16" Tire with 7,000 mile on them they look pretty much new, he just drove mostly pavement back and forth to work. Also has Kenwood stereo with up graded speakers and amp. PW, PDL, P-mirrors, A/C, CC, tow package, factory bed liner and rubber bed mat. Super clean truck through out. $28,950 SOLD! 1993 Ford 7.3 Turbo Diesel, 5spd. transmission. Extra cab XLT 4x4. Only 89,367 original miles. 1 owner with most all paper work from same mechanic. Its had the complete fuel system gone thru including both fuel tanks new. PW, PDL, A/C, CC, AM/FM cass, sliding rear window, tow package, tires excellent. The condition of this truck is amazing, Interior like new, exterior excellent with a few chips and light scratches. Runs and drives like new. Very hard truck to find in this condition. # B-1762 $9,450 SOLD ! 1999 Ford Diesel F-350 Super Duty XLT Super Cab 4x4 Dually Flatbed. 111,638 original miles. 7.3 power stroke, 6 speed ZF manual trans, Turbo mounted aftermarket exhaust brake, cab controlled engine fan clutch, gear venders auxiliary overdrive, heavy duty air bag suspension on all four corners, Heavy duty upgraded sway bars front and rear, 5th wheel hitch, multiple electric air compressors with storage tanks for compressed air. Winches, aftermarket differential cover with temp gauge, pyrometer, turbo pressure and many other gauges to monitor drive train. Real nice condition through out. # B-1761 $19,500 NOW! $15,950 SOLD! 1965 Toyota Land Cruiser 4x4. 350 V-8, Turbo 350 automatic. PS, PB, Restored in early 80's. same family own every since always kept under cover. It has a good solid body and the paint looks good but is showing its age. Interior has buckets front and rear seat, Top looks to be newer and is in good shape. Motor has new Carb. and run good and don't smoke. Transmission shifts good. Some things that need attention - The wipers not working, Heater switch works but blower hardly runs, and the vacuum canister on top off transfer case don't engage front end. # B-1758 $9,750 SOLD! 1971 VW Super Beetle. 1 Family owned Arizona car with 132,408 original miles. Car was painted once 5 years ago because of fade, no body damage or rust. Everything else on car is suppose to be original except CD player and speakers. Super clean car everywhere you look including engine compartment. Everything on car works proper including heater. Runs and drives excellent! # A-1947 $7,950 SOLD! 1965 Honda Trail 90. Two owner, same owner for past 25 years. Very nice original condition, just spent $200 on maintenance. Both High and Low gear sprockets. 4spd transmission. 4,866 miles. Runs excellent, ready to ride. I have the original Title. $950 SOLD! 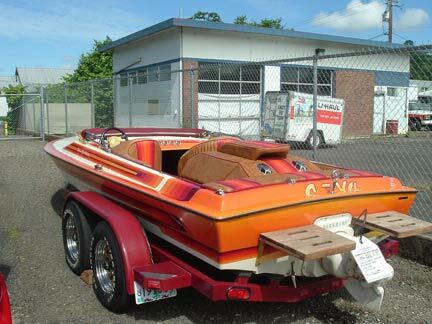 1986 Bahner Ltd Edition 19' Jet Boat. One owner just like new condition. All original with just 230 Hours. 454 V-8, Berkeley Jet. Comes with all the original manuals and papers. Always Garaged. Exterior and interior in near perfect condition. The haul of the boat is as clean as the rest of the boat. Everything on boat works as it should. Trailer is in excellent condition. Hard to find a boat this well kept ! # C-224 $9,250 NOW! $7,250 SOLD! 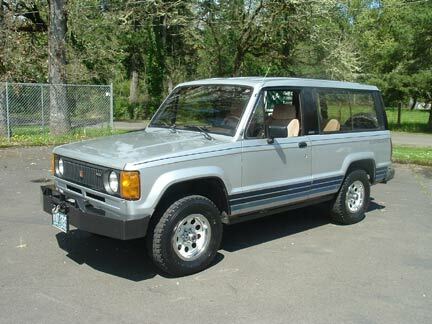 1986 Isuzu Trooper II TURBO DIESEL. 5spd. These Factory Diesel Troopers are hard to find and this would have to be one of the best around. Some history - I've had a classic car dealer for 30yrs and in 1995 this was a trade in on a classic and I kept as one of my personal rigs since it was so nice and rare. It had about 70,000 miles on it then and now it has 169,500. I have all records and receipt. In 2000 at just over 100,000 miles it felt like it might have lost a little power so I took it to Oregon fuel injection and spent $2,700 plus, They put a new Turbo, injection pump, glow plugs, rebuilt and cleaned injectors, tested everything and said motor was as good as new. Not all of this was necessary but I maintain my vehicles regularly. In 2005 I had a local shop check out my A/C, put a new a/c pump in with 134 refrigerant, at the same time the heater box was completely rebuilt with all new doors, seals, heater core just everything new over $1,100 spent and works perfect. Also a new radiator around the same time, it never had any heating problems it was just time to change. I have changed the oil every 3,000 miles with Delo 400 15w-40 and the air filter and fuel filter every 3rd oil change so every 9,000 miles. There are lots of other things done through the years like Complete brake job and master cylinder, Clutch cable, rebuilt alternator ect. Trooper has original paint and interior in excellent condition, I put custom fit seat covers over the buckets too save them there are no tears, still has all the original decals. No need to ask about rust it don't have any and has always been garaged. All gauges, lights, A/C ect. works like new. I put a 6,000 pound Warn winch in custom built bumper on many year ago but never used it. Have original front bumper also that would bolt right back on in factory holes. This Trooper will not use oil and runs and drive like a new one. SOLD!